Harrison's Pepper Lifetime Course 1lb. 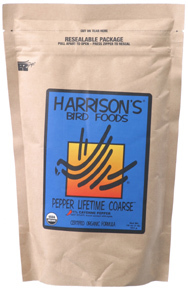 Home > Pellets > Harrison's Pepper Lifetime Course 1lb. Harrison's Maintenance formula meets the nutritional requirements (after a 6 month periond on High Potency) for healthy, non-breeding, non-molting birds including pinus, Amazons, cockatoos, macaws and other medium to large birds. Medium: Mini Macaws, Small Cockatoos, etc. Guaranteed Analysis: Crude Protein min 15%, Crude Fiber max 6.5%, Crude Fat min 5.5%. Smell the product for freshness prior to feeding. Squeeze all air out of the bag and zip it shut at the top. If the zip lock gets removed or damaged, fold the top over several times and close with a clip. Keep food in original bag. Do not repackage into plastic bags or containers. Harrison's Adult Lifetime Fine 1lb.